The wonderful Tithorea ( Velitsa as it used to be known ) is built on the foot of the north east side of Mount Parnassos and is 157 km from Athens which takes approximately 2 hours by car. It's distance from Kato Tithorea is 5km and 9km from the nearby village of Amfiklia. Just outside the village there is a unique forest full of pine, cedar, and acorn trees. On the eastern side of Tithorea you will find the 'Kahala Gorge' with rocks in various shapes and lots of caves. In the gorge there are the remains of the very old water mill. Also in the gorge and only 3km from the village, hidden in the rocks, is the cave of OD. Andoutsou. At the central Square there is a large Plane tree that was planted there in 1887.The paths E65 that start from 'Platanako' are on the south east side of the village. If you follow this path, after approximately 1000m you turn to the right and you will meet the St George church, with the very large acorn trees. If you follow the path from St George's church you can visit the OD Androutsou cave which is about 1000 meters. If you continue along the path towards the left you will meet the water mill that is inside the gorge, and ends in Tithorea. For trekkers, this path is a delightful way to spend an afternoon exploring the region. The history of Tithorea started some 2000 years ago and it's first name was 'Neon'. 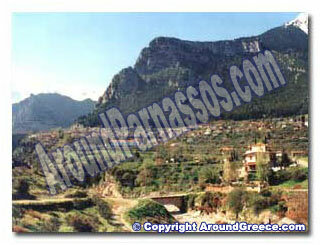 The name Tithora  Tithorea, according to Pafsanias, came about from a hill side of Mount Parnassos with that name. Later was called Velitsa, which was a Slovakian name.